The Warsaw Uprising of 1944 carries an incomparable message of heroism to those who would listen. For those whose hearts are Polish, the history of those times in 1944 is a familiar tale of survival, valor, heartache, and strength. For others, Poland’s role in the Second World War is a distant afterthought to the struggles of their own culture, or at least, the culture with which they’re familiar. For countrymen around the world, and indeed for those whose WWII fascination lies with peoples and countries other than Poland, the herculean struggles at Normandy, Stalingrad, the Ardennes, or Berlin, overshadow Poland and her efforts. Engulfed by Nazi Germany and the Soviet Union, Poland sought her freedom against terrible odds, at the point of the bayonet, in the flames of the petrol-bomb, and at the tip of the pen in the negotiating rooms of the west. But for some, that struggle is a forgotten relic of history; an afterthought to the heroism of those who re-drew the map of Europe after victory was won. So, how can we thus inspire people to recognize Poland’s efforts? How can we combat the old stereotypes in honor of the hundreds of thousands of brave Poles and their allied comrades-in-arms who sacrificed everything for a free republic, surrounded on all sides by the monsters of fascism and communism? How do we salute the heroes of Westerplatte, Wizna, and Warsaw; and of Monte Cassino, the Falaise Pocket, and of Market Garden? From the cockpits above the clouds of London, to the engine-rooms of submarines below the waves, citizens and soldiers of Poland are worthy of our highest praise for shaping the free world of today, arm-in-arms with the Allies of yesteryear. But the problem remains: how do we tell their story? On the campus of the Orchard Lake Schools, it’s our privilege to work where over a century of Polish identity has flourished. The hallowed grounds that today surround the many monuments to great Poles and Polish-Americans, have witnessed countless celebrations, memorials, and events by which our identity has been tempered; reinforced; preserved for generations to come. But we are amidst a changing landscape today—Polish can only be heard in the corners of Hamtramck, Belle Isle hasn’t seen a Polish Constitution Day celebration in years, and the fraternal groups have dwindled to only the most dedicated members. Are we doing enough to carry on the story of our heroes? Should we be doing something different? The answers to this question requires self-reflection, composure, and a clear idea of what we want as Polish-Americans. The answer we propose at The Polish Mission, is simple: education. Our founder, Fr. Józef Dąbrowski believed in the primacy of learning—he recognized the value of teaching as a means to not only make our community more intelligent, but a noble pursuit that acts as a foundation for our identity here in the United States. As we carry out our mission here in Orchard Lake in the footsteps of Fr. Dąbrowski, we endeavor to do precisely that. Shall we repeat the same proud history to ourselves over and again? We must draw new people who want to hear the story of Poland, and we have to foster a sense of curiosity and intrigue in them. On the 226th anniversary of the adoption of the Polish Constitution of 1791, we at The Polish Mission welcomed a most honored guest from Washington, D.C.: Professor Julian Kulski. To many, he a familiar public figure; an advocate of Poland, a renowned architect, a consummate professional, and hero of the Warsaw Uprising of 1944. He was the son of the Mayor of Warsaw during the Nazi German occupation of Poland, and as a determined young man, he joined the patriotic citizenry of Warsaw in carrying out the largest urban uprising in human history. Prior to that, he was a member of the Polish underground army (Armia Krajowa – AK), and carried out clandestine missions with his fellow secret-soldiers, thwarting the Nazi efforts to dominate the people of Poland. He’s one of the few that are left to tell us of the great heroism of that time, in the most vivid detail! Though authors and filmmakers have tried their best to capture and preserve the past, it was Kulski’s eye that put the rifle-sight on the Nazi invaders of his home, his finger that pulled the trigger, and his heart that was broken amidst the terrible tragedy. Dr. Kulski, like Mrs. Halina Konwiak and Mr. Janusz Lewakowski and so many others, are the heroes of our time, who personally defended their freedom (and ours today) from oppression. Nothing is more precious than their willingness to share their experiences from the 1940s, but their wisdom and guidance for the modern day, is also most valuable. That’s why it was our sincerest pleasure to welcome Dr. Kulski to the International Academy in Bloomfield Hills where teacher Marc DeZwaan’s class was waiting to hear from the visiting WWII hero. Dr. Kulski presented a short film to the class of eager students that included even included Principal Lynne Gibson and Associate Principal Christopher Smith, and other IA faculty who didn’t want to miss an opportunity to hear a one-of-a-kind account of the Warsaw Uprising. At times, the movie was paused and the IA students were given the opportunity to ask questions. Some asked for more detail about his experience, others wanted to know about the political climate, and still more were curious about Kulski’s friends and family. With gripping detail and kind attention to the young students, he responded with meaningful answers and thought-provoking accounts, aimed precisely at inspiring the students to learn more. After the presentation, and with only moments left in class, the students rushed to buy copies of The Color of Courage. Dr. Kulski took the time to write dedications in each of them. 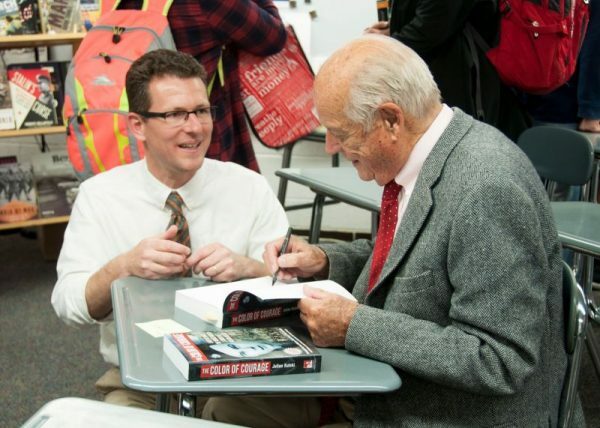 With newly-taken selfies, an autographed copy of his book, and even some Polish chocolate, the students left the class with a new perspective of the Second World War: a Polish perspective, as authentic as can be. The following day, it was our pleasure to introduce Dr. Kulski to Mrs. Konwiak and Mr. Lewakowski and their families & friends at Wawel Restaurant in Sterling Heights (inside the Polish Cultural Center). Each of them fought for freedom in the streets of Warsaw 72 years ago, and that day they finally met for the first time over coffee and appetizers, right here in Michigan. The afternoon was filled with reminiscing, proud boasting of large families and accomplishments, new lives in the United States after the war, and the joy of meeting new friends. In the rubble of Warsaw so many years ago, could they have seen each other amidst the smoke and hail of bullets? Perhaps in the briefest of moments in passing an order, or a fleeting moment of rest, nestled behind cover. It’s impossible to know, but the fact remains that we’ve brought them together here, and that’s a privilege of indescribable value. After a presentation at the annual Constitution Day celebration at Our Lady of Czestochowa Parish on Sunday, Dr. Kulski was off to the airport, to continue his good work in DC, and elsewhere. Please join The Polish Mission in offering our deepest thanks to all of the Polish WWII veterans, and especially to Dr. Kulski for taking the time to visit our community here in Michigan. Please also join us in thanking Marc DeZwaan and his colleagues at International Academy for their kind welcome, Bozena Bienias for her assistance in planning and logistics, Fr. Andrzej Maślejak, Ted & Genia Gorecki, Ania Bankowska, Alicja Karlic, Tomasz Kielar, and everyone else who helped to make Dr. Kulski’s visit so special. For more news from The Polish Mission, please see our website: www.polishmission.com, and follow us on social media for the latest updates. I would like to speak to Mr. Kulski.